As happens time and time again, at a professional learning experience related to technology, I learned not as much about technology as about learning. I’ve enrolled in Charting a Direction for Online Learning, a year long course designed for educators at independent schools. The course is sponsored by Online School for Girls, a learning organization serving a consortium of independent girls schools by assisting member schools to collaboratively develop blended learning experiences for their students. Most of the learning in this professional course occurs on-line, yet this past week I attended the first of two face to face sessions. “Blended and online learning is as evolving of a field is there is in education. It is flipped on its head every six months or so,” shared Brad Rathberger, Director of Online School for Girls. We are beginning to recognize the potential to dramatically shift control of learning from teachers to students not as much through the technology as through the previously unimaginable potential for flexibility in the use of space and time made possible with technology. Among the greatest moments of learning was the opportunity to hear from a number of students at School of the Holy Child. “We learn a lot about responsibility, academic integrity, learning to work with other people, and flexibility,” shared one of these very impressive high school seniors, reflecting on a course she was taking in multi-variable calculus. Participating in a college level math course, and interacting with some of the top female high school math students in the country, she interestingly didn’t reflect as much on math or technology, as on learning and growth, noting with maturity how she is less shy and more able to manage her time than she had been prior to her online learning experience. Students rotate through three broad types of activities in a continuous loop: individualized online instruction, teacher-led instruction, and collaborative activities and stations. This is the simplest blended learning model. Alternatively, instead of one component of online learning there are two components, the individualized on-line instruction and the on-line assessments. Students rotate through four broad types of activities in a continuous loop: individualized online instruction, individualized online assessment, teacher-led instruction, and collaborative activities and stations. There is direct instruction for 3/4 of the day in math/science and literacy/social studies with teachers. There is a learning lab with on-line activities for the rest of the day, supervised by paraprofessionals. There is a central computer lab along with numerous other learning settings, chosen depending on what a student might need; intervention, seminars, direct instruction, and group projects. Students learn in a massive computer lab staffed by paraprofessionals for about half their day; and work with teachers in small groups for the other half. They come together for lunch and social activities. There is a physical place for students to come to learn in a collaborative environment when they choose to do so. Students can also work at home with their online teacher. They are not required to be in school. Students participate in supplemental on-line courses. Independent mission-driven schools, not yet as fast moving or skilled at collaboration with other schools as we will need to become, must overcome a number of challenges, and capitalize on numerous strengths and opportunities, in order to design our own solutions for utilizing on-line and blended learning. If we are not proactive, as Brad Rathberger warns, we may find ourselves forced into solutions that do not reflect our missions. As we move forward, what shall we consider in the move to blended learning options? How might we imagine anew possibilities for use of space, time, and financial resources? How might we assess the quality of on-line options? How might we support teachers to adapt and prepare for teaching and learning in a blended environment? How might we prepare our students? What cautions might we consider? What might inspire and enable us to dream? As the newly appointed facilitator of YU2.0 , an on-line community of practice dedicated to educational technology integration in Jewish schools, I anticipated the results of a survey we sent to all members with excitement. I sat with the data when it arrived, a plethora of questions swirling in my mind. So much feedback; so much insight. And yet, something felt not quite right. But, what? Pondering further, it struck me. Sitting alone analyzing data for a community negated the wisdom of community. Why not collaboratively reflect, wonder about implications and dream about possibilities collaboratively? And so, in search of creative collaboration and multiple perspectives, I share with you our data. Your insights, perspectives, wisdom, and reflection will support a Community of Practice better to meet the needs of members. Who are the members of YU2.0? We are teachers, technology coordinators, administrators, and more. 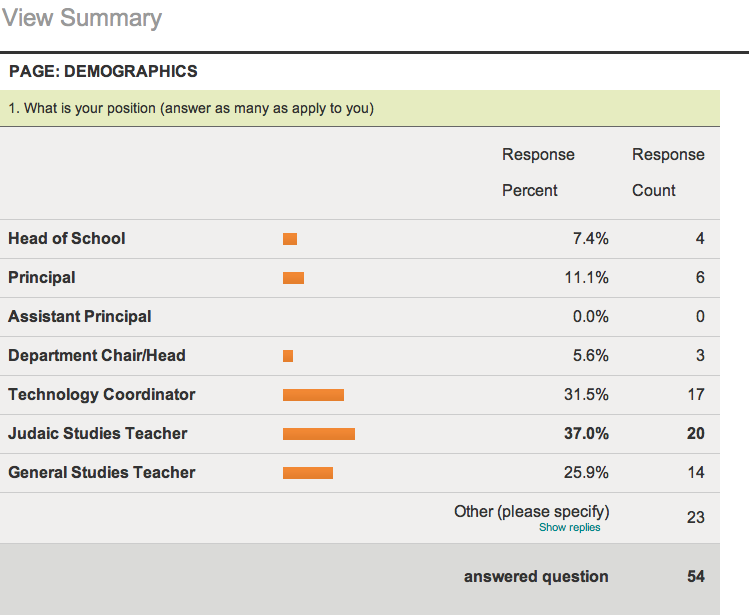 37% of us are Judaic studies teachers, 25.9% of us are general studies teachers, and 5.6% of us are department chairs. 31.5% of us are technology coordinators and there are a number of technology directors as well. 11.1% of us are principals and 7.4% of us are heads of school. Also included among our members are a school board president, the Director of Educational Leadership at a Board of Jewish Education, a curriculum writer, student programming directors and coordinators, a parent, a religious school director, and a learning strategist. Why do we participate in YU2.0? What do we hope to learn with YU2.0? One member wrote of interest in flipped learning both for classrooms and faculty meetings. Another wrote in interest in fundraising for moving to a technology based education and communication system. Several wrote in about interest in blended and on-line learning, including school-industry partnerships. What are obstacles we face in terms of more effectively utilizing educational technology and social media? A number of members wrote in that financial constraints are a significant obstacle. One wrote in that lack of interest among teachers who have little time is an obstacle. One wrote in that educational technology duplicates preexisting materials without proven benefits. What are the benefits of YU2.O to our members? How might we expand our Community of Practice? How might we use our periodic e-mail updates? 40.8% of members find the periodic e-mail updates valuable and 4.1% find them very valuable. 38.8% find them somewhat valuable and 16.3% find them not so valuable. 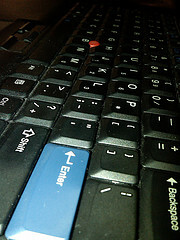 Items members would like included in periodic e-mail updates in the future include: top post, best links to new information, technology that improves a specific aspect of education rather than how to integrate technology into education (focus on education with technology as a tool, rather than technology as the goal with education being the platform), information on teaching Judaic Studies with technology, event updates, innovations, ideas, resources, how other professionals and teachers are using various tools in the classroom, connections to current events, what schools are doing, and new groups that have formed within YU2.0. What are leadership roles of interest to members? What questions does this data raise for you? What recommendations, based on the data, do you have for our Community of Practice? How might we reflect, analyze, dream, and plan?